On the seat cover and foam front, I do have a couple of front seats that I don't need. Between the two you could make a good one. I don't think the heater elements work, but if you're interested pm me. Perhaps we should do a Sausagefest 2018 parts swap soon... I've got a bunch of stuff to clear out too. I have a manual front right door regulator for a 242/244. Right side? Thats what they all say... If its a nice tight right, and not too expendy, Ill take it. I really need a left though. That's the bad one. Won't fit on the left side. Believe me, I've tried. :( Sorry! I've got a couple of what I think are 242 regulators inherited from a pile of 2xx crap I brought back from Victoria... couldn't tell you if they're power or manual without inspecting them further. Anyone have a set of stock front 240 struts? 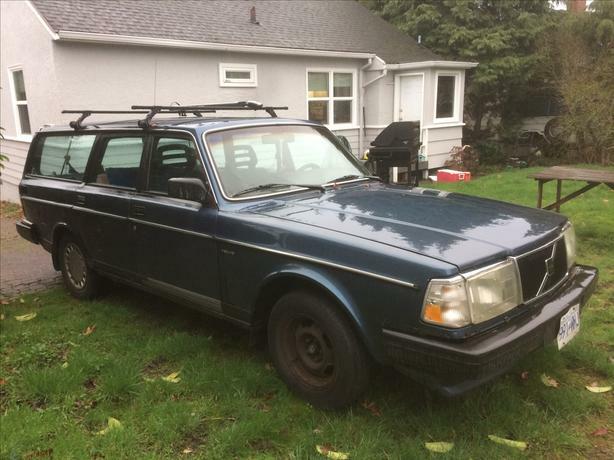 I picked up a 1991 240 wagon, EFI, 5 speed, 195k on the clock, power windows, 2" receiver hitch with electric brake, no A/C to see if it was savable or a parts car. I think it is more of a parts car, there's too much work needed to make it usable. - It is driveable (just loud). - Front and back plastic bits are in good shape - grille and headlights not cracked or broken, back lights the same. The headlights could use a polish. - rusty around the back wheel, mostly on the passenger side, rusted through where the doorsill / rocker meets the wheel well. - rear power windows don't work, front ones did but today they wouldn't. - driver's seat is beat, the rest of the interior is decent. - smells a bit moldy inside. I did some cleaning and got rid of visible mold, but there is still a bit of a smell. - water gets in somewhere - probably through the rusty bits. - there is an odd whining noise from time to time. Seems to be related to the car's speed, not engine speed. It's about the same with clutch up or down, in gear or neutral. - exhaust is hanging off the manifold by one nut. One stud is broken, one nut is missing. The exhaust pipes seem to be pretty solid... but catalytic converters are worth $160 at the scrap yard. I can get $400 for it (complete, or pretty close) at a scrap yard, but before it goes there I wanted to see if someone wanted the car, or parts off it. If a couple of guys wanted to pick a day to some and strip parts off it, I have a covered area where this could be done. It is shared with neighbors, so we have to be respectful, and the carcass has be rollable once we are finished. I put some photos in dropbox at https://goo.gl/1cbMGH I also tried to insert some photos in this post. I am in North Burnaby. Shoot me a PM if you are interested. If it gets parted out, I am definitely interested in the driveshaft, and possibly the clutch fork for my manual swap. Also the fan and fan shroud as well. Last edited by billkaz; 02-02-2018 at 04:09 PM.. Unfortunately my misspent youth makes it impossible for me to cross the border ...my dad lives in everett though, so he's gonna check some stuff out for us down there. Exchange rate isn't super great so I'm hoping to keep it local. lol, ok. The car that you own, other than the carburetor setup, it's decent, right? Another option would be to pull the LH 2.2 stuff off an '85-'88 240 and install it on the B21A. Then, it'd be like one of the really late 1982 US 240's, but with a more common LH variant. Oh her old wagons long gone, it was a $200 rust bucket that was beyond saving. Good first car though, ran like a top at 300,000 kms, kept her busy with wiring issues, and she didn't feel bad when she let it go. She's had a couple toyotas since, but her current ride is an early 3 litre 4 runner and she's not stoked on it. I think she misses the ease of 240 maintenance, she's my assistant in keeping my heap on the road, and she knows there's nothing we can't take care of in a weekend of work. The desire for LH is mostly based on the parts hoard in my garage, we've torn down 2 240s and a 740 over the last 2 years and have kept most everything we thought we might need later. I'm sure she would prefer older, but she's going off to school in nanaimo in September and I think a well sorted LH car will be less trouble. I guess the longer we wait and look the more money we can put aside for this, so that's good. Excellent! The daughters in nanaimo right now, hopefully she can make her way down there to check it out. I brought this complete car home yesterday. I'll be keeping many parts, but if you're interested in something pm me. Well, we found our daughter a car. 1 owner 89 245, 290 k, manual, no accidents, full service history, and located in West Vancouver. 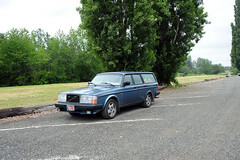 The PO is a Swede (of course), and he used the car as a work vehicle for many years. Its free of any real rust, just a few minor bubbles on the passenger side rocker. Its had rust repair to the buttcheek on that side so I am a little concerned that the rocker may be rusting out from the inside, but it passed the screwdriver stab test all the way along so we shall have to wait and see. I'm pretty happy with the state of the car, its been used as intended its whole life by a man who cared for it and appreciated it for what it is. He didn't baby it but he didn't beat it up either, and he had it serviced religiously. The interior is blue, and a little worn, but not terrible. Its a respray from silver, the new color is pretty close to 601 red. It got the respray when he had the rust repair done. Its a decent paint job, they only did the exterior though so it shows silver on the jambs and stuff. Still, it presents well with decent shine. The hatch needs rewiring, the drivers seat is worn, and it doesn't have alloys, but man did it ever sound good from a cold start in -2 weather! No ticks, no clanks, no clunks. No belt noise even. Its so cool to see how well these cars hold up when they're treated right. They were asking $1975 which I found to be a reasonable number all things considered, so I agreed to it. Its funny, we nearly went for the 93 in Burnaby the other day but Lili really wanted standard and so we decided to wait and see what else might turn up. (yeah right, I thought to myself) I'm glad we did, it may not be quite as pretty, but it FEELS so good when you drive it! I think this is the right car for her. I feel really lucky to have got this one, its not perfect, but its way nicer than anything I've ever bought for my self. I will admit I'm a little jealous of that third pedal , but I can wait and find my own. Only 1 pic for now, pretty much the same as the CL ad but you get the idea. I saw that on CL too! Glad you got it! Final sausagefest at my current place. 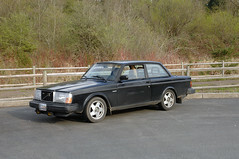 I've given my notice and there's gonna be a pile of Volvo goodness to go away up to and including the entire V8 265. Any interest? I'm here 'til the end of March, so I've got a bit of time... 17th? 24th? 3rd? I'm out for the 3rd. Other two dates a bit too far out to say for sure right now. Interested in coming by though! Conditions were better than last year (no blizzard), but it was still pretty icy and a few cars stuffed it on the second last regularity section and missed the last one. 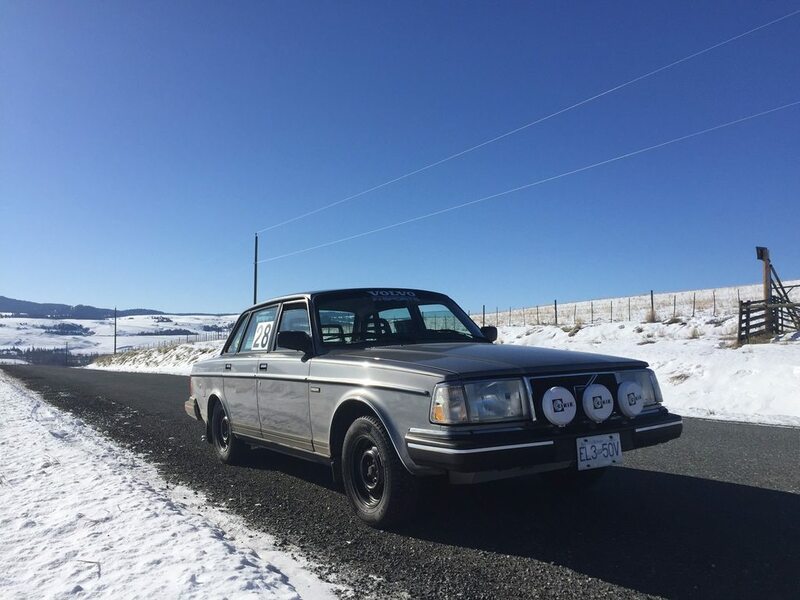 Something like 430 km over 11 stages, plus transits, plus getting back and forth to Merritt meant plenty of quality Volvo seat-time. We did OK - 21st out of 36 entries. We were 3rd out of 8 RWD cars, and we beat most of the novices and even three 4wd Subarus. RWD historic is clearly a more difficult path, but it gives us a good excuse for not placing highly. 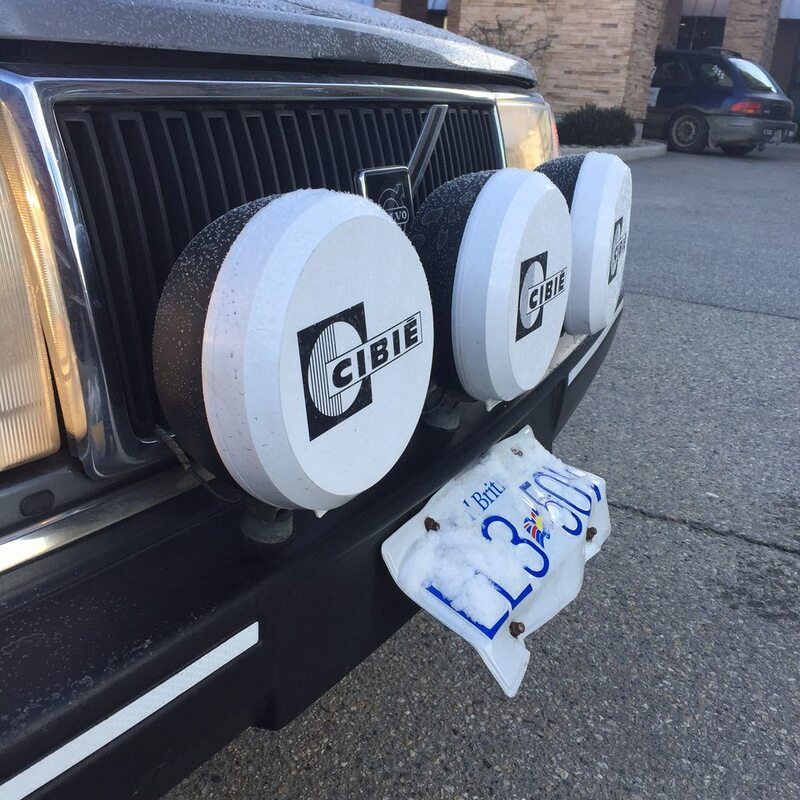 Only one snowbank this year - I didn't even have to push and the only damage was a properly mangled license plate.